View or download the PDF (2 MB). 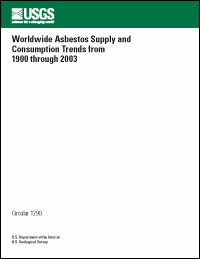 This Circular updates and supersedes U.S. Geological Survey (USGS) Open-File Report 03–083, "Worldwide Asbestos Supply and Consumption Trends from 1900 to 2000," with the addition of supply and consumption estimates and analysis from 2001 through 2003 and revisions to the consumption estimates for 1998 through 2000. The text from Open-File Report 03–083 also has been updated in this Circular to include revisions to and expansion of the time-series coverage. The use of asbestos is one of the most controversial issues surrounding the industrial minerals industry. Its carcinogenic nature, an overall lack of knowledge of minimum safe exposure levels, its widespread use for more than 100 years, and the long latency for the development of lung cancer and mesothelioma are the main contributing factors to these controversies. Another factor is that, despite decades of research, the mechanisms responsible for its carcinogenic properties are still largely unknown. The United States produced about 3.29 million metric tons (Mt) of asbestos and used approximately 31.5 Mt between 1900 and 2003. About half of this amount was used after 1960. In 2002, the last asbestos mine in the United States closed, marking the end of more than 110 years of U.S. asbestos production. Cumulative world production from 1900 through 2003 was about 181 Mt. If one assumes that unusually large stocks were not maintained and that world consumption roughly equaled production, then about half of the world production and consumption occurred between the end of 1976 and the end of 2003. The United States and Western European nations were the largest consumers of asbestos during the first two-thirds of the 20th century. They were surpassed by the collective production and consumption of Kazakhstan and Russia by the 1970s. After the onset of the health issues concerning asbestos in the late 1960s and early 1970s, the decline in world production and consumption began to be evident in the late 1970s and early 1980s. The 1991 breakup of the Soviet Union, a major user of asbestos, resulted in a significant decline in asbestos consumption and production in former Soviet-bloc countries. Consumption and production in Kazakhstan and Russia increased through 2003 from 2001, albeit to a much lower level than in the 1980s. In 2003, world consumption was estimated to be 2.11 Mt, about 45 percent that of 1980. Relatively few countries in Asia, the Middle East, South America, and the former Soviet Union remained as the leading users of asbestos. China was the leading consuming nation, using an estimated 492,000 metric tons (t) in 2003. China was followed, in decreasing order of consumption, by Russia (429,000 t), India (192,000 t), Kazakhstan (174,000 t), Ukraine (156,000 t), Thailand (133,000 t), Brazil (78,400 t), and Iran (75,800 t). These eight countries accounted for 82 percent of the world's apparent consumption in 2003. Following Iran, in decreasing order of consumption by tonnage, were Uzbekistan (42,400 t), Vietnam (39,400 t), Indonesia (32,300 t), the Republic of Korea (23,800 t), Kyrgyzstan (23,700 t), Japan (23,400 t), and Mexico (20,100 t). Consumption in all other countries was estimated to be less than 15,000 t each in 2003. Sizable consumption increases occurred in Azerbaijan, China, India, Iran, Kazakhstan, Thailand, and Ukraine between 2000 and the end of 2003. Consumption patterns in countries using less than 5,000 t per year were too erratic to ascertain any trends in their use of asbestos.